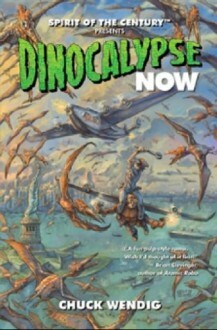 Spirit of the Century presents Dinocalypse Now! When the Century Club is called in to prevent the assassination of FDR, it's just another day on the job - but what they discover puts not just the President, but the entire world in jeopardy. With psychic dinosaurs taking over Manhattan and beyond, it's up to Sally Slick, Jet Black, Mack Silver, and the other Centurions to save humanity - from extinction! The last couple of chapters dragged me in until the end of the book and I couldn't reading.It was pretty cool to see my name in the kickstarter credits.